reminders and flag certain reminders as important. An important item will be emphasized by an orange tab to the left of the reminder’s text. The app will incorporate an action bar menu, context menus, a local database for persistence, and multiple selection on devices that support multiple selection. 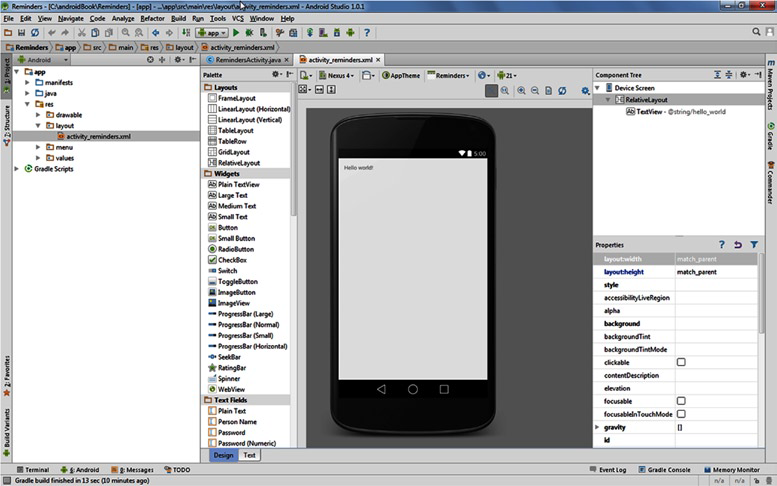 Figure 5-1 illustrates the completed app running on the emulator. This example introduces you to Android fundamentals and you will also learn how to persist data by using the built-in SQLite database. Don’t worry if some of the topics are unfamiliar; later chapters cover those topics in greater detail. Note We invite you to clone this project using Git in order to follow along, though you will be recreating this project with its own Git repository from scratch. If you do not have Git installed on your computer, see Chapter 7. Open a Git-bash session in Windows (or a terminal in Mac or Linux) and navigate to C:\androidBook\reference\ (If you do not have a reference directory, create one. On Mac navigate to /your-labs-parent-dir/reference/) and issue the following git command: git clone https://bitbucket.org/csgerber/reminders.git Reminders. 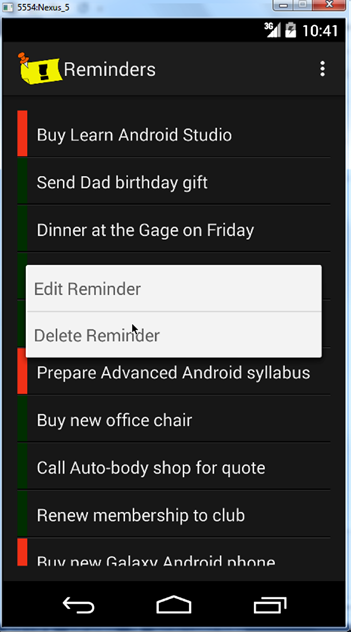 Tapping any reminder in the list opens a context menu with two options, shown in Figure 5-4:Edit Reminder and Delete Reminder. Tapping Edit Reminder from the context menu opens the Edit Reminder pop-up dialog box shown in Figure 5-5, where you can change the text of the reminder. 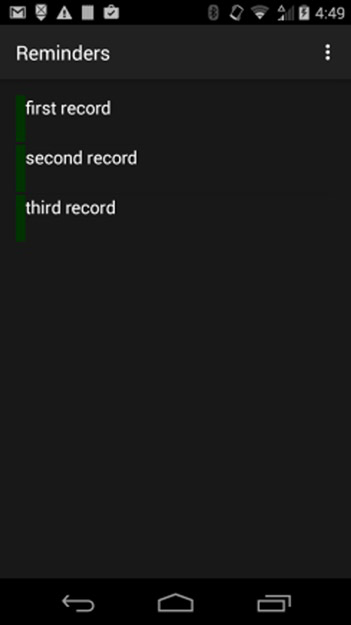 Tapping Delete Reminder from the context menu deletes the reminder from the list. Start a new project in Android Studio by using the New Project Wizard as explained in Chapter 1. Enter Reminders as the application name, set the company domain to gerber.apress.com, and choose the Blank Activity template. Save this project under the path C:\androidBook\Reminders. It’s a good idea to keep all of your lab projects in a common folder such as C:\androidBook (or use ~/androidBook for Mac/Linux) for consistency with our examples. On the next page of the wizard, select Phone and Tablet and set the Minimum SDK to API 8: Android 2.2 (Froyo). By setting your min API level to 8, you are making your app available to more than 99% of the Android market. Click the Next button, choose the Blank Activity from the available templates, and click Next again. Set the activity name to RemindersActivity and then click Finish, as shown in Figure 5-6. 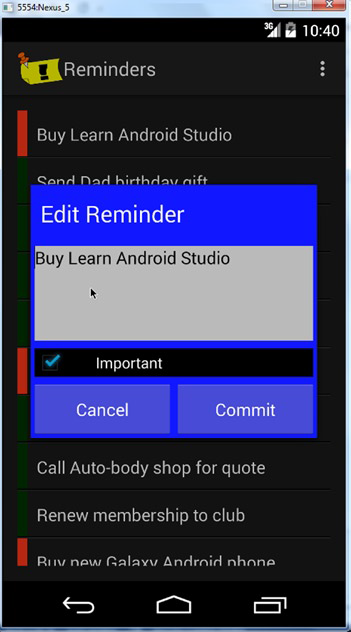 Android Studio displays activity_reminders.xml in Design mode. 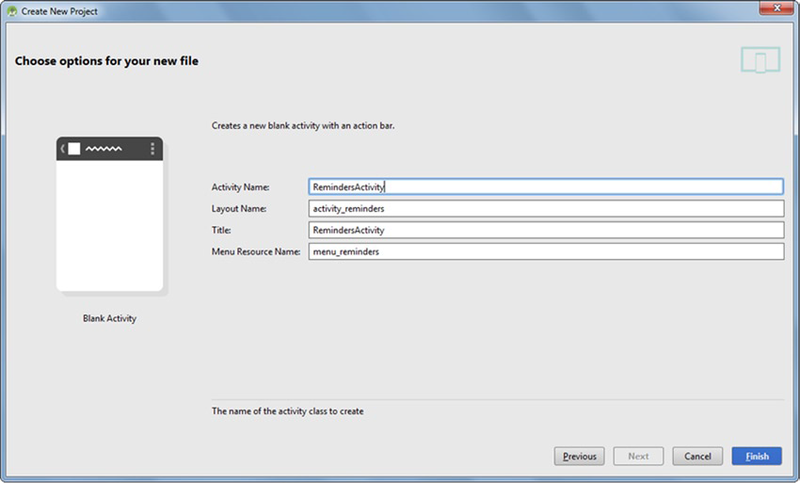 The activity_reminders.xml file is the layout for your main activity, as shown in Figure 5-7. As discussed in Chapter 1, the project should run on either an emulator or a device at this point. Feel free to connect your device or launch your emulator and the run the project to try it out. Your first step after creating a new project should be to manage the source code with version control. All the labs is this book use Git, a popular version-control system that works seamlessly with Android Studio and is available online for free. Chapter 7 explores Git and version control more thoroughly. If you do not already have Git installed on your computer, please refer to the section entitled Installing Git in Chapter 7. 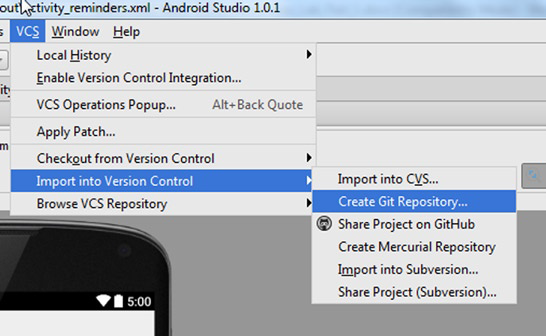 Choose VCS ➤ Import into Version Control ➤ Create Git Repository from the main menu. (In the Apple OS, choose VCS ➤ VCS Operations ➤ Create Git Repository.) Figures 5-8 and 5-9 demonstrate this flow. When prompted to select the directory for Git init, make sure that the Git project will be initialized in the root project directory (again, called Reminders in this example). Click OK.
You will notice that most of the files located in the Project tool window have turned brown, which means that they are being tracked by Git but have not yet been added to the Git repository nor are they scheduled to be added. 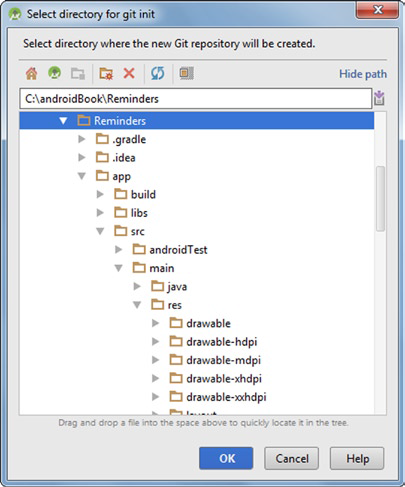 Once your project is under Git’s control, Android Studio uses a coloring scheme to indicate the status of files as they are created, modified, or deleted. This coloring scheme will be explained in more detail as we progress though you can research this topic in more detail here: jetbrains.com/idea/help/file-status-highlights.html. Click the Changes tool button located along the bottom margin to toggle open the Changes tool window and expand the leaf labeled Unversioned Files. This will show all files that are being tracked. To add them, select the Unversioned Files leaf and press Ctrl+Alt+A | Cmd+Alt+A or right-click the Unversioned Files leaf and choose Git ➤ Add. The brown files should have turned green, which means that they have been staged in Git and are now ready to be committed. Press Ctrl+K | Cmd+K to invoke the Commit Changes dialog box. Committing files is the process of recording project changes to the Git version control system. As shown in Figure 5-10, the Author drop-down menu is used to override the current default committer. You should leave the Author field blank, and Android Studio will simply use the defaults you initially set during your Git installation. Deselect all check-box options in the Before Commit section. Put the following message in the Commit Message field: Initial commit using new project wizard. Click the Commit button and select Commit again from the drop-down items. By default, the Project tool window should be open. The Project tool window organizes your project in different ways, depending on which view is selected in the mode drop-down menu at the top of the window. By default, the drop-down menu is set to Android view, which organizes the files according to their purpose and has nothing to do with the way the files are organized on your computer’s operating system. As you explore the Projects tool window, you will notice three folders under the app folder: manifests, java, and res. The manifests folder is where your Android manifest files can be found. The java folder is where your Java source files may be found. The res folder holds all of your Android resource files. The resources located under the res directory may be XML files, images, sounds, and other assets that help define the appearance and UI experience of your app. Once you’ve had the opportunity to explore Android view, we recommend switching to Project view which is more intuitive because it maps directly to the file structure on your computer. By default, Android Studio opens the XML layout file associated with the main activity in a new tab of the Editor and sets its mode to Design, so the Visual Designer is typically the first thing you see in your new project. The Visual Designer lets you edit the visual layout of your app. In the middle of the screen is the Preview Pane. The Preview Pane displays a visual representation of an Android device while rendering the results of the layout you are currently editing. This representation can be controlled by using the preview layout controls across the top of the screen. These controls adjust the preview and can be used to select different (or multiple) flavors of Android devices, from smartphones to tablets or wearables. You can also change the theme associated with your layout description. On the left side of the screen, you’ll find the Control palette. It contains various controls and widgets that can be dragged and placed onto the stage, which is a visual representation of the device. The right side of the IDE contains a component tree that shows the hierarchy of components described in your layout. The layout uses XML. As you make changes in the Visual Designer, these changes are updated in XML. You can click the Design and Text tabs to toggle between visual- and text-editing modes. Figure 5-11 identifies several key areas of the Visual Designer. Let’s start by creating a list of reminders. Click the Hello World TextView control on the stage and then press Delete to remove it. Find the ListView control in the palette and drag it onto the stage. As you drag, the IDE will display various measurement and alignment guidelines to help you position the control which will tend to snap to the edges as you drag close to them. Drop the ListView so that it aligns with the top of the screen. You can position it either at the top-left or the top-center. After it is positioned, find the Properties view on the lower-right side of the Editor. Set the id property to reminders_list_view. The id property is a name you can give to controls that allows you to reference them programmatically in Java code; and this is how we will refer to the ListView later when we modify the Java source code. Change the layout:width property in the Properties window and set it to match_parent. This will expand the control so that it occupies as much space as the parent control it lives within. You will learn more about the details of designing layouts in Chapter 8. For now, your layout should resemble Figure 5-12. In Android, an activity defines the logic that controls user interaction with your app. When learning Android for the first time, it helps to think of an activity as a screen within your app, though activities can be more complicated than that. These activities typically inflate a layout which define where things appear on-screen. The layout files are defined as XML but can be edited visually using the Visual Designer as described earlier. Click the Text tab along the bottom to switch from visual editing to text editing. This brings up a view of the raw XML for the layout, along with a live preview to the right. Changes you make to the XML are immediately reflected in the preview pane. Change the background color of the RelativeLayout to a dark grey by inserting android:background="#181818" underneath the line which reads android:layout_height="match_parent". Colors are expressed in hexadecimal values. See Chapter 9 for more information on hexadecimal color values. Notice that there is now a dark-grey swatch that appears in gutter next to the line you inserted which set the background color of the root ViewGroup.If you toggle back to Design mode, you will observe that the entire layout is now dark-grey. Hard-coding a color value directly in your XML layout file is not the best approach. A better option is to define a colors.xml file under the values resource folder and define your colors there. The reason we externalize values to XML files such as colors.xml is that these resources are kept and edited in one place and they can be referenced easily throughout your project. Select the hex value #181818 and cut it to your clipboard by using Ctrl+X | Cmd+X or by choosing Edit ➤ Cut. Type @color/dark_grey in its place. This value uses special syntax to refer to an Android color value named dark_grey. This value should be defined in an Android resource file called colors.xml, but because this file does not yet exist in your project, Android Studio highlights this error in red. Press Alt+Enter and you will be prompted with options to correct the error. Select the second option, Create Color Value Resource dark_grey, and then paste the value in the Resource value: field of the next dialog box that appears and click Ok. The New Color Value Resource dialog box will create the Android resource file colors.xml and fill it with the hexadecimal value. Click OK and then click OK in the Add Files to Git dialog box to have this new file added to version control and be sure to select the Remember, Don’t Ask Again checkbox so that you’re not bothered with this message again. Figure 5-13 demonstrates this flow. The ListView in preview mode contains row layouts that do not provide enough contrast with our chosen background color. To change the way these items appear, you will define a layout for the row in separate layout file. Right-click the layout folder under the res folder and choose New ➤ Layout Resource File. Enter reminders_row in the New Resource File dialog box. Use LinearLayout as the root ViewGroup and keep the rest of the defaults as seen in Figure 5-14. You will now create the layout for an individual list item row. The LinearLayout root ViewGroup is the outermost element in the layout. Set its orientation to vertical by using the controls in the toolbar at the top of the preview pane. Be careful when you use this control because horizontal lines indicate a vertical orientation and vice versa. Figure 5-15 highlights the Change Orientation button. Find the properties view along the bottom right of the preview pane. Find the layout:height property and set it to 50dp. This property controls the height of a control, and the dp suffix refers to the density-independent pixels measurement. This is a metric that Android uses to allow layouts to scale properly regardless of the screen density on which they are rendered. You can click any property in this view and start typing to incrementally search for properties, and then press the up- or down-arrows to continue searching. your layout. Find the class property of the view you just placed using the properties window in the properties pane to the right and change it to android.view.View to work around this limitation. Refer to Listing 5-1 to see how this is done. pixels measurement which performs like dp, but also respects the user’s text size settings so that, for example, if the user were hard of sight and wanted text on her phone to display large, sp would respect this setting, whereas dp would not. Therefore, it’s always a good idea to use sp for textSize. You will learn more about screen measurements in Chapter 8. Finally, set the TextView control’s text property to Reminder Text. Switch to Text mode and make additional changes to the XML so that your code resembles Listing 5-1.
row_text component and set its android:textColor attribute to @color/white. As before, these colors are not defined in the colors.xml file, and you will need to use the same process as before to define them. Switch to Text mode. Press the F2 key repeatedly to jump back and forth between these two additional errors and press Alt+Enter to bring up the IntelliSense suggestion. Choose the second suggestion in both cases and fill in the pop-up dialog box with the values #ffffff for fixing the white color and #003300 to fix the green color. After using the suggestion dialog box to fix these errors, you can hold the Ctrl key and left-click any of these colors which will bring you to the colors.xml file and should look like Listing 5-2. Return to the activity_reminders.xml layout file. You will now connect the new reminders_row layout to the ListView in this layout. Switch to Text mode and add the following attribute to the ListView element: tools:listitem="@layout/reminders_row" as shown in Figure 5-16. Adding this attribute doesn’t change the way the layout renders when it runs; it merely changes what the preview pane uses for each item in the list view. To make use of the new layout, you must inflate it using Java code and we will show you how do that in a subsequent step. You have just completed a custom layout for your ListView rows, but you shouldn’t stop there. Adding a few visual enhancements will make your app stand-out from the others. Take a look at how the text renders on-screen. A careful eye will catch how it is slightly off-center and runs up against the green tab on the left. Open the reminders_row layout to make some minor adjustments. You want the text to gravitate toward the vertical center of the row and give a bit of padding so as to provide some visual separation from the side edges. Replace your TextView element with the code in Listing 5-3. The additional ellipsize attribute will truncate text that is too long to fit in the row with an ellipsis on the end, whereas the maxLines attribute restricts the number of lines in each row to 1. Finally, add two more generic view objects from Listing 5-4 after the inner LinearLayout but before the closing tag of the outer LinearLayout to create a horizontal rule beneath the row. The outer LinearLayout is set to a height of 50dp, and the inner LinearLayout is set to a height of 48dp. The two generic view objects will occupy the remaining vertical 2dp inside the layout creating a beveled edge. This is shown in Listing 5-4. You will now make changes to the activity that uses the layout you just modified. 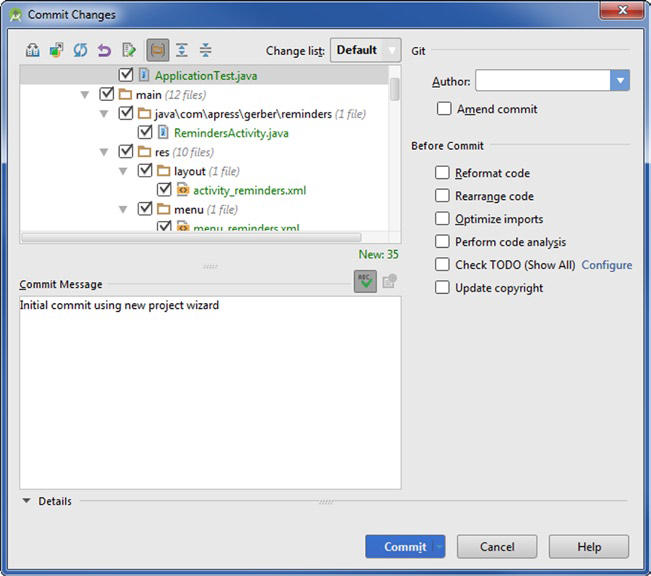 Open the Project tool window and find the RemindersActivity file under your java source folder. It will be located under the com.apress.gerber.reminders package. Find the onCreate() method in this file. It should be the first method defined in your class. Declare a ListView member called mListView and change the onCreate() method to look like the code in Listing 5-5. You will need to resolve the imports ListView and ArrayAdapter. given in the ArrayAdapter constructor displayed in the list view as seen in Figure 5-17. Press Ctrl+K | Cmd+K to commit your changes to Git and use Adds ListView with custom colors as the commit message. As you work through a project, it is good practice to perform incremental commits to Git while using commit messages that describe the features each commit adds/removes/changes. Keeping this habit makes it easy to identify individual commits and later build release notes for future collaborators and users. icon produces a menu with a single menu item entry called settings. This menu item is placed there as part of the new project wizard template and is essentially a placeholder that performs no action. The RemindersActivity loads the menu_reminders.xml file, which is found under the res/menu folder. Make changes to this file to add new menu items to the activity as seen in Listing 5-6. In the preceding code listing, the title attribute corresponds to the text displayed in the menu item. Since we’ve hard-coded these attributes, Android Studio will flag these values as warnings. Press F2 to jump between these warnings and press Alt+Enter to pull up the IntelliSense suggestions. You simply need to press Enter to accept the first suggestion, type a name for the new String resource, and as soon as the dialog box pops-up, press Enter again to accept the named resource. Use new_reminder for the name of the first item and exit for the second. Open RemindersActivity and replace the onOptionsItemSelected() method with the text in Listing 5-7. You will need to resolve the import for the Log class. When you tap a menu item in the app, the runtime invokes this method, passing in a reference to whichever MenuItem was tapped. The switch statement takes the itemId of the MenuItem and either performs a log statement or terminates the activity, depending on which item was tapped. This example uses the Log.d() method that writes text to the Android debug logs. If your app contained multiple activities and those activities were viewed prior to the current activity, then calling finish() would simply pop the current activity off the backstack and control would pass to the next underlying activity. Because the RemindersActivity is the only activity in this app, the finish() method pops the one and only activity off the backstack and results in the termination of your app. Run the app and test the new menu options. 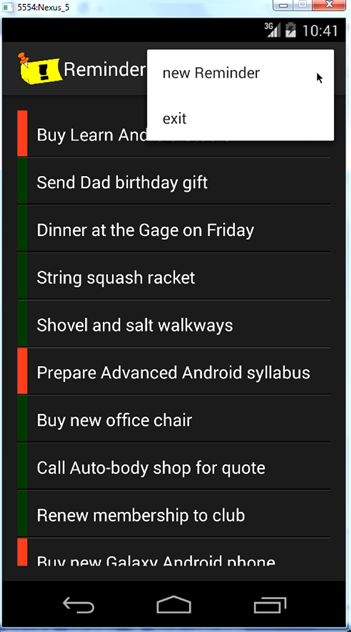 Tap the new Reminder menu option and watch the Android log to see the message appear. The Android DDMS (Dalvik Debug Monitor Service) window will open as you run your app on your emulator or device, and you will need to select the Debug option under Log Level to see debug logs. Run your app and interact with the menu items. 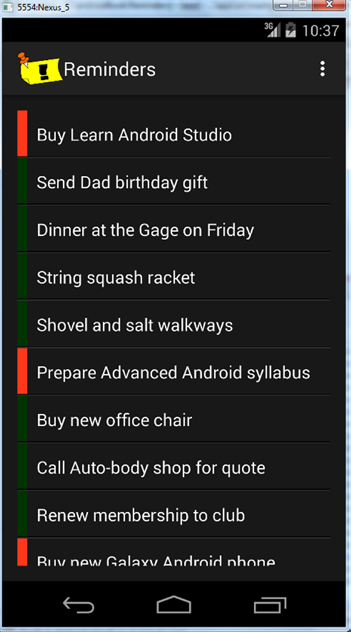 Pay attention to the logs in the Android DDMS window as you tap the New Reminder menu item. Finally, press Ctrl+K | Cmd+K and commit your code to Git using Adds new reminder and exit menu options as your commit message. Because the Reminders app will need to maintain a list of reminders, you will need a persistence strategy. The Android SDK and runtime provide an embedded database engine called SQLite, which is designed to operate in constrained memory environments and is well suited for mobile devices. This section covers the SQLite database and explores how to maintain a list of reminders. Our strategy will include a data model, a database proxy class, and a CursorAdapter. The model will hold the data that is read from and written to the database. The proxy will be an adapter class that will translate simple calls from the app into API calls to the SQLite database. Finally, the CursorAdapter will extend a standard Android class that deals with data access in an abstract way. rather than boolean here because the SQLite database does not have a boolean datatype. you will notice that DatabaseHelper is not found in the Android SDK. We will define the DatabaseHelper class in a subsequent step. This code defines the column names and indices; a TAG for logging; two database API objects; some constants for the database name, version, and the main table name; the context object; and a SQL statement used to create the database. DatabaseHelper is a SQLite API class used to open and close the database. 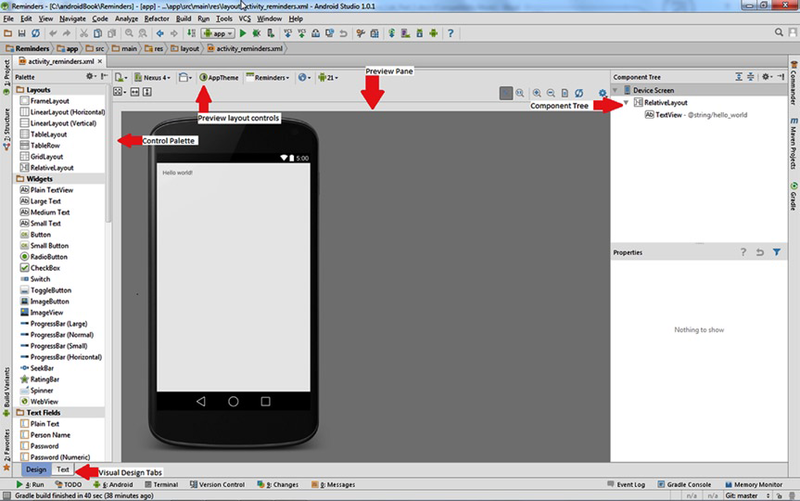 It uses Context, which is an abstract Android class that provides access to the Android operating system. DatabaseHelper is a custom class, and must be defined by you. Use the code in Listing 5-10 to implement DatabaseHelper as an inner class of RemindersDbAdapter. Place this proceeding code towards the end of the RemindersDbAdatper but still inside RemindersDbAdapters enclosing braces. DatabaseHelper extends SQLiteOpenHelper, which helps maintain the database with special callback methods. Callback methods are methods that the runtime environment will call throughout the life-cycle of the application, and they use the SQLiteDatabase db variable supplied to execute SQL commands. The constructor is where the database is initialized. The constructor passes the database name and version to its superclass; and then the superclass does the hard work of setting up the database. The onCreate() method is called automatically by the runtime when it needs to create the database. This operation runs only once, when the app first launches and the database has not yet been created. The onUpgrade() method is called whenever the database needs to be upgraded, for example if the developer changes the schema. If you do change the database schema, be sure to increment the DATABASE_VERSION by one, and onUpgrade() will manage the rest. If you forget to increment the DATABASE_VERSION, your app will crash even in debug build mode. In the preceding code, we run a SQL command to drop the one and only table in the database before running the onCreate() method to re-create the table. The code in Listing 5-11 demonstrates using DatabaseHelper to open and close the database. The constructor saves an instance of Context, which is passed to DatabaseHelper. The open() method initializes the helper and uses it to get an instance of the database, while the close() method uses the helper to close the database. Add this code after all the member variable definitions and before the DatabaseHelper inner class definition inside the RemindersDbAdapter class. 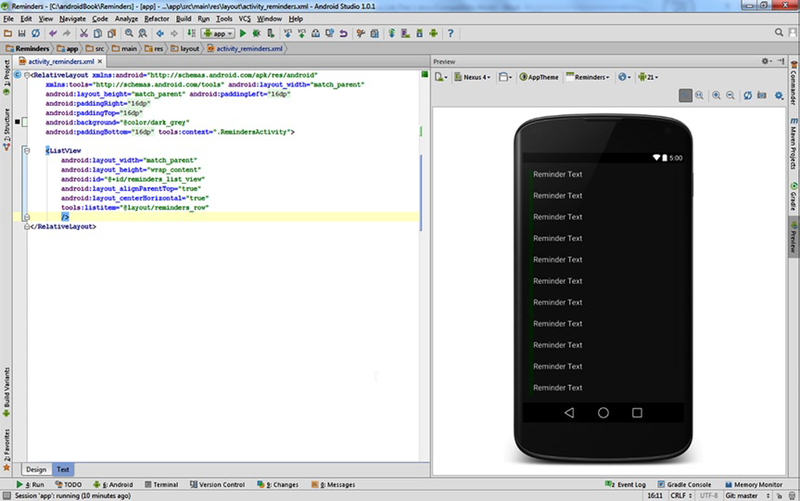 When you resolve imports, use the android.database.SQLException class. Listing 5-12 contains all the logic that handles the creating, reading, updating, and deleting of Reminder objects in the tbl_remdrs table. These are usually referred to as CRUD operations; CRUD stands for create, read, update, delete. Add the proceeding code after the close() method inside the RemindersDbAdapter class. Each of these methods uses the SQLiteDatabase mDb variable to generate and execute SQL statements. If you are familiar with SQL, you may guess that these SQL statements will be in the form of an INSERT, SELECT, UPDATE, or DELETE. The two create methods use a special ContentValues object, which is a data shuttle used to pass data values to the database object’s insert method. The database will eventually convert these objects into SQL insert statements and execute them. There are two read methods, one for fetching a single reminder and another for fetching a cursor to iterate all reminders. You will use Cursor later in a special Adapter class. The update method is similar to the second create method. However, this method calls an update method on the lower-level database object, which will generate and execute an update SQL statement rather than an insert. Last, there are two delete methods. The first takes an id parameter and uses the database object to generate and execute a delete statement for a particular reminder. The second method requests that the database generate and execute a delete statement to remove all the reminders from the table. Deselect all check-box options in the Before Commit section.